They came from Eveleth, Minneapolis, Sault Ste. Marie and New York City. They included a goalie called Mr. Zero, a menacing Italian - Jewish defense combination, the captain of the last new York Rangers Stanley Cup winners, a National Hockey League referee and a graduate of the Long Island City YMCA Roller Hockey League. A blend of amateur and professional players made up one of the finest hockey teams to represent Uncle Sam. They even had a pair of championships to prove it. They were the U.S. Coast Guard Cutters out of Curtis Bay, Maryland. The brainstorm of a former Michigan hockey player-turned sailor, the Cutters were organized shortly after the Japanese attacked Pearl Harbor. 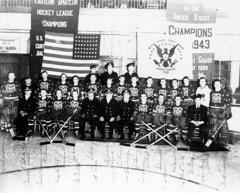 They played through the 1942-43 and 1943-44 seasons in the Eastern Amateur Hockey League, considered to be one of the most competitive leagues of its time. 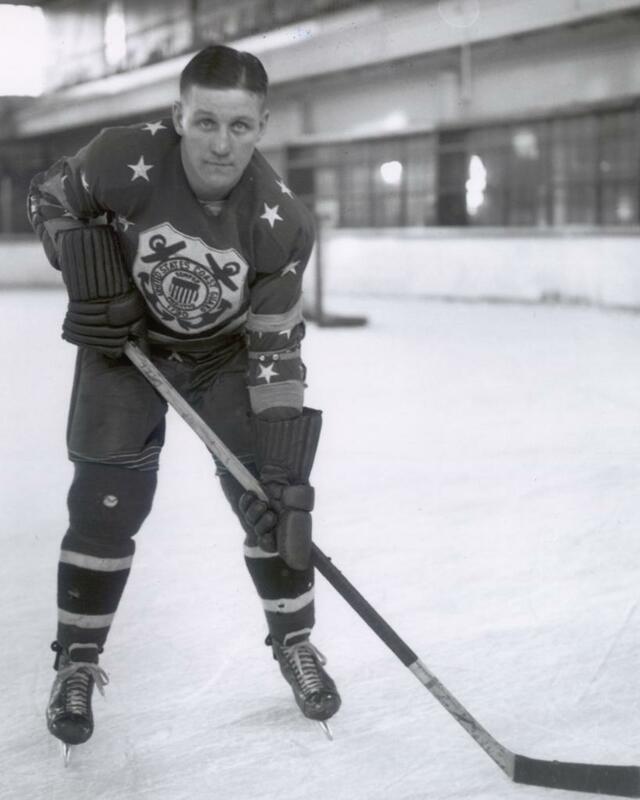 They also played a number of exhibition games and once, at Carlin's Iceland in Baltimore, their home ice, the Cutters went head-on against the Stanley Cup champion Detroit Red Wings. Although they were involved in only two full campaigns, the Cutters detonated more fights, filled more seats and generally raised more hell than the Eastern League has ever known. 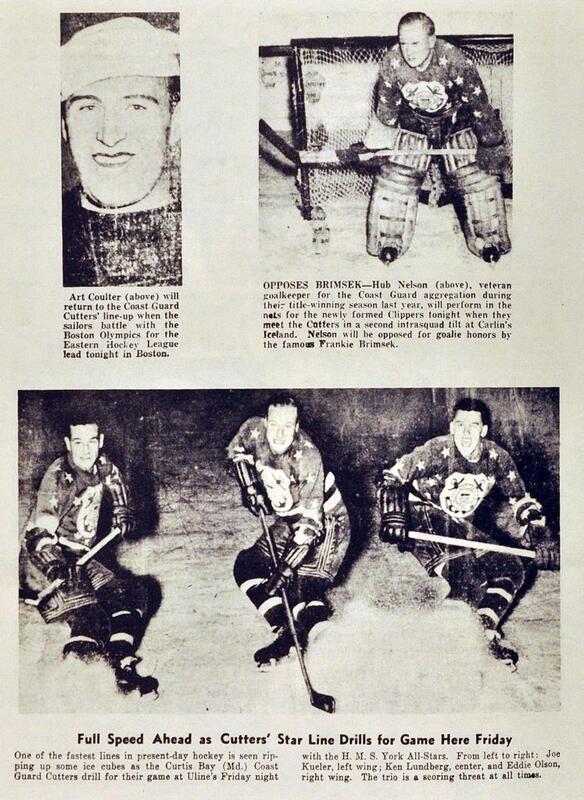 "There was nothing like them, before or since," said the St. Louis Blues President Emile Francis, who was strafed by the Cutters while goal tending for the Philadelphia Falcons. Ironically, the Cutters' most intense competition was amongst themselves. 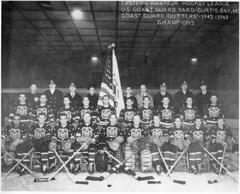 "Our intra-squad games," said former Coast Guard star Bob Gilray, "were like bloody massacres." A special ambiance surrounded the Cutters wherever they played. 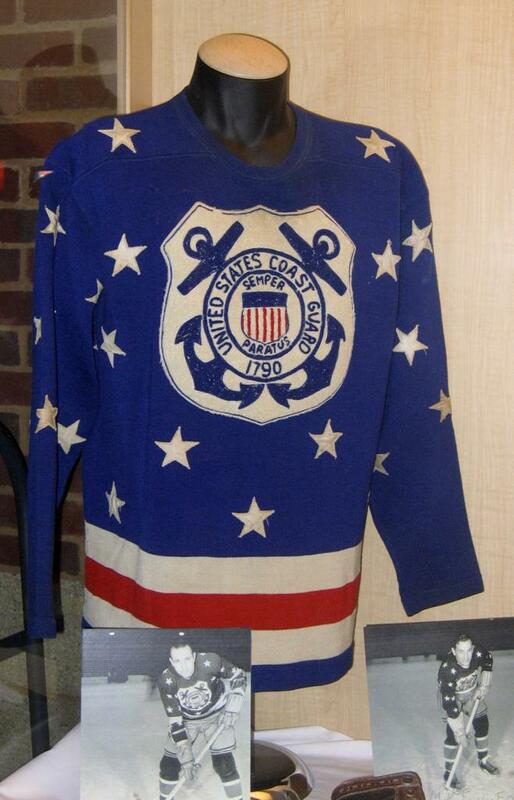 They wore unusual red-white-and-blue, star-spangled jerseys with crossed anchors emblazoned on the front and, unlike any other hockey club, they were accompanied by a 30-piece marching band providing razzmatazz at every game. 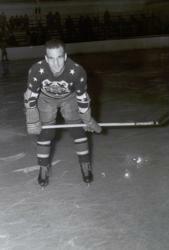 "Whenever we scored," said Mike Nardell, a one-time roller hockey ace, "they'd strike up Semper Paratus, the Coast Guard marching song. I loved that team so much I never wanted to take off my equipment. 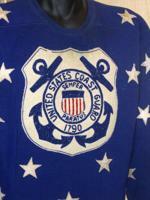 Years later, when I played pro for the Clinton (N.Y.) Comets, I'd always wear my Coast Guard jersey under my Comets uniform." Nardello was in select company. Hall of Famer Frank (Mr. 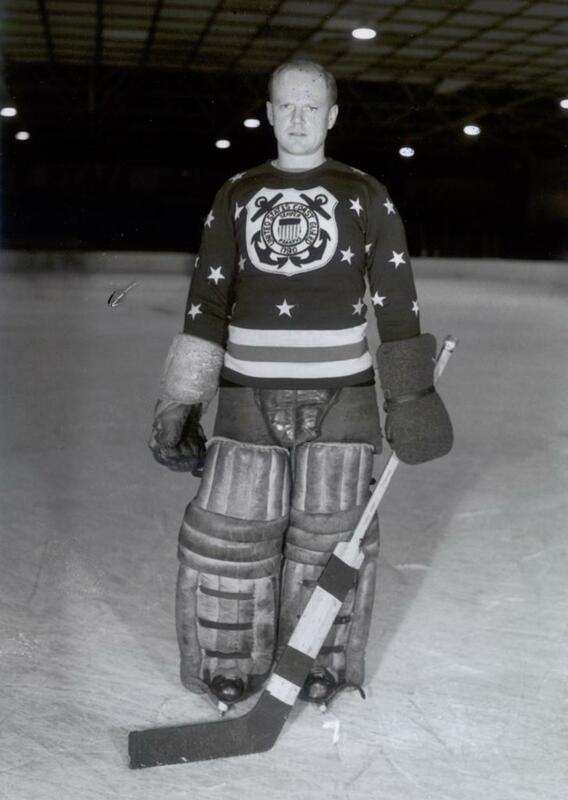 Zero) Brimsek, who orchestrated the Boston Bruins to a 1941 Stanley Cup title, was one of the three superb goalies on the Cutters along with Muzz Murray and Hub Nelson. 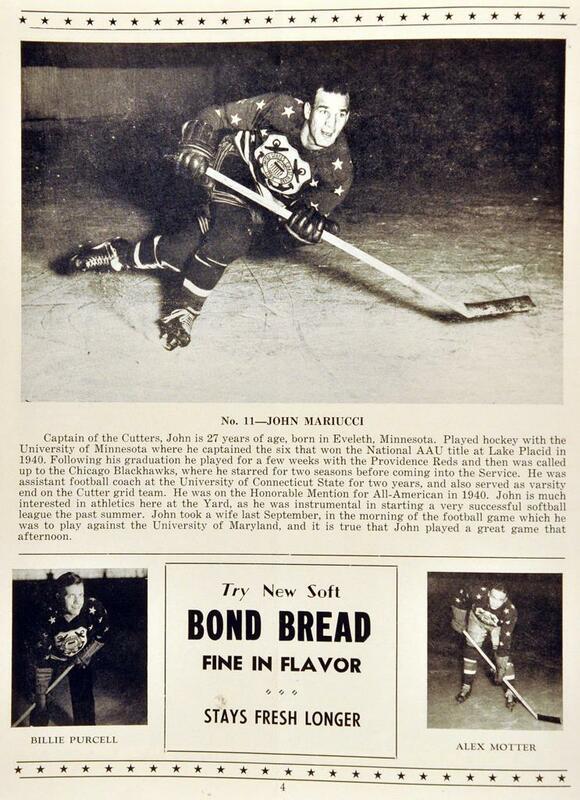 Minnesotan's played a significant role on the team. In addition to Brimsek, Nelson, Mariucci, Dill, Cotlow, Kucler and Lundberg represented the State of Hockey. 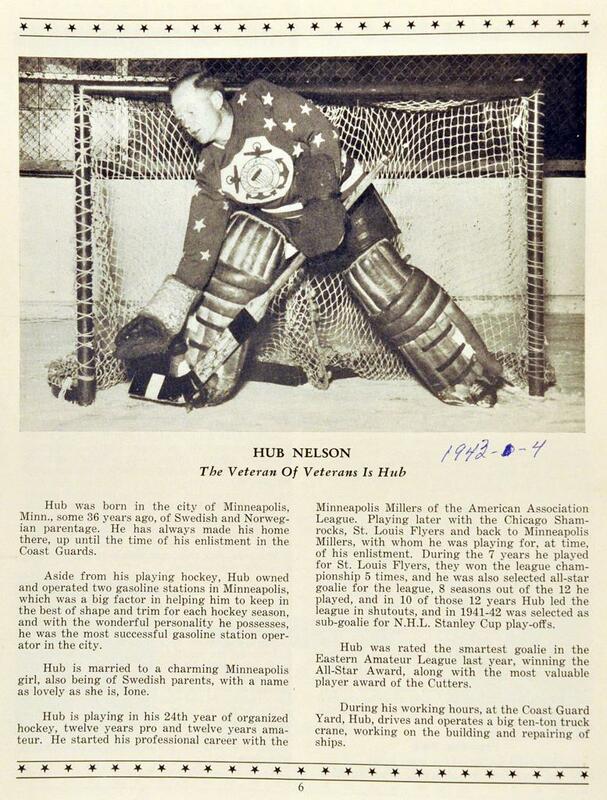 Mariucci and Brimsek were also from Eveleth, Dill was from St. Paul while Minneapolis claimed Nelson and Cotlow. 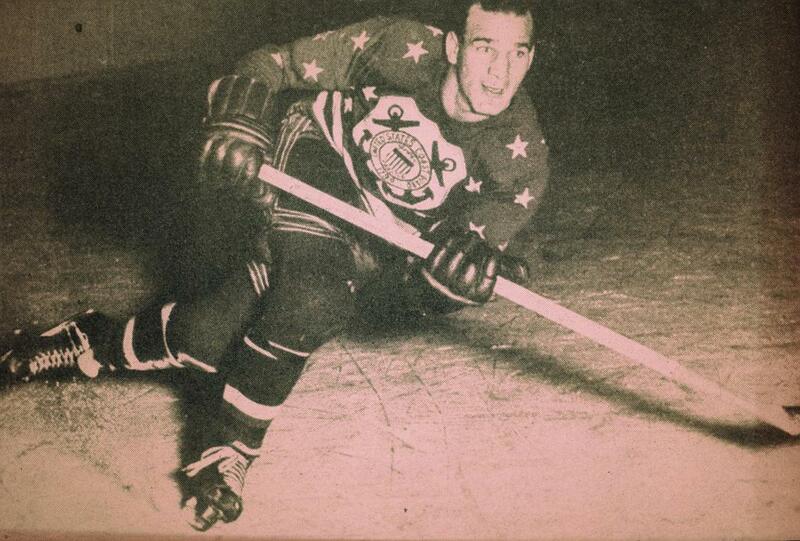 The Coast Guard defense bristled with ex-Rangers' captain Art Coulter and Alex Motter of the Red Wings as well as the terrifying tandem of Chicago Black Hawks bruiser Johnny Mariucci and Manny Cotlow, a Jewish defenseman who would just as soon eat railroad spikes as T-bone steaks. "Manny," said Gilray, "was responsible for one of the biggest riots in hockey history." 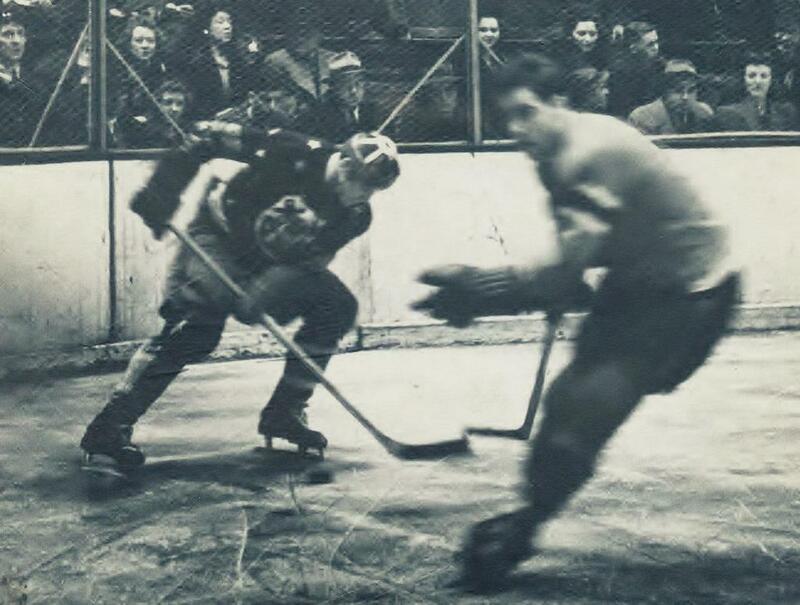 The eruption occurred at the Philadelphia Arena after Cotlow and Marty Madore of the Falcons clashed on the ice and, again, in the penalty box. A posse of Philadelphia fans ambushed Cotlow, triggering a counter attack by Cotlow and Bob Dill. Another battle started on the ice. The officials were soon on their knees in hand-to-hand combat with players from both teams. A police riot squad was called in to subdue the battlers. Although they reveled in rough play, the Cutters didn't have to fight to win. 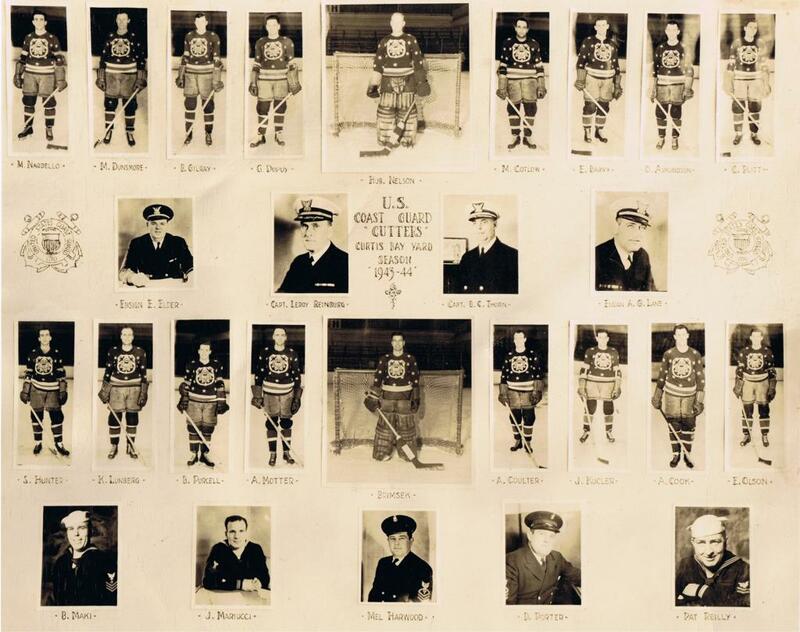 The line of Gilray, Joe Kucler and Eddie Olson delivered a formidable offense and provided endless joy for Lieutenant Commander C. R. MacLean, a former player from Sault Ste. 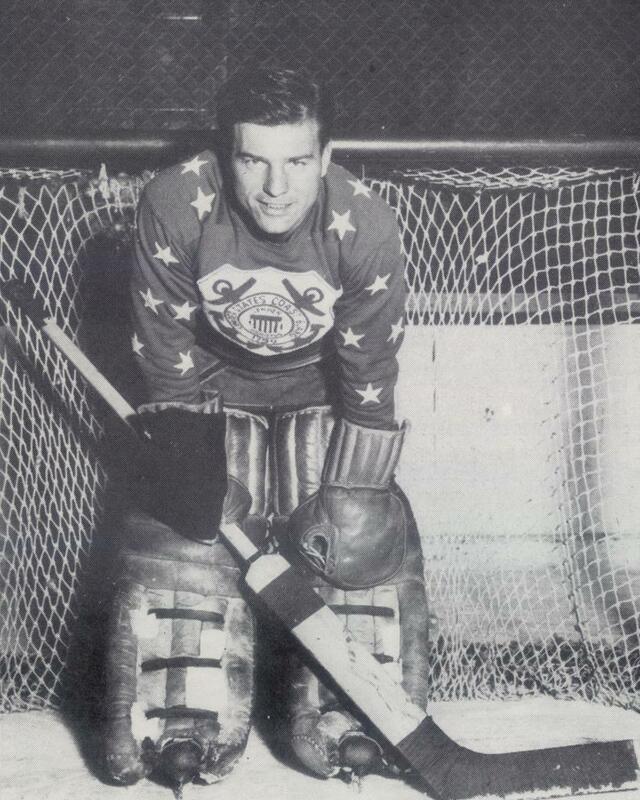 Marie, Michigan, who fathered the team in 1942. 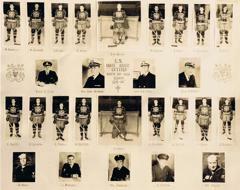 MacLean, the Personnel Officer at the Curtis Bay Yard, encouraged American-born hockey players to join his unit. The Canadian-born Coulter was an exception. He had always wanted to obtain American citizenship and seized the opportunity when war broke out. The Ranger stalwart enlisted in the Coast Guard, joined the Cutters and became a naturalized American citizen. 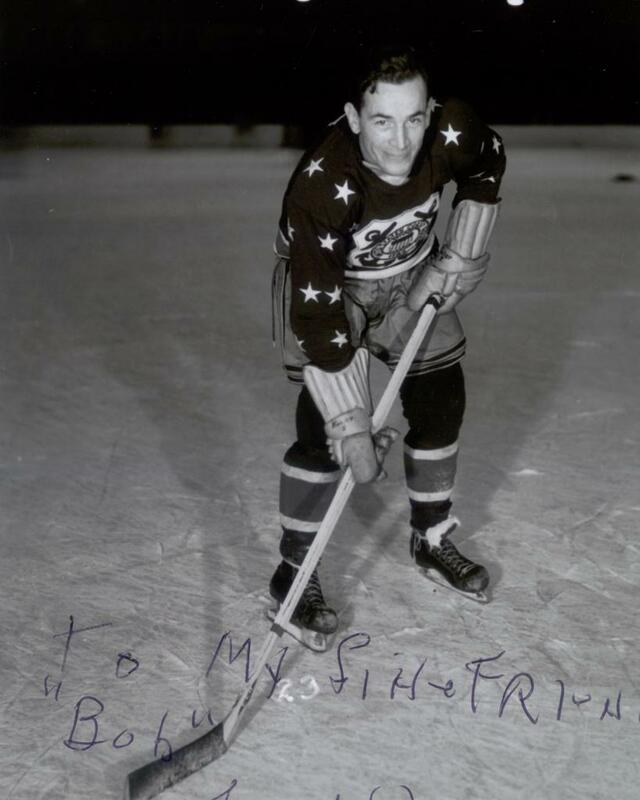 In time, MacLean had so many stick handlers he divided the Cutters into two teams - the Clippers and the Cutters - who competed against each other when they weren't involved in Eastern League action. They once played a brutal four-game series which Cotlow described as "the most physical games of my life." George Taylor, writing in the Baltimore News-Post, observed: "The rubber tilt was more exciting than the Stanley Cup playoffs." 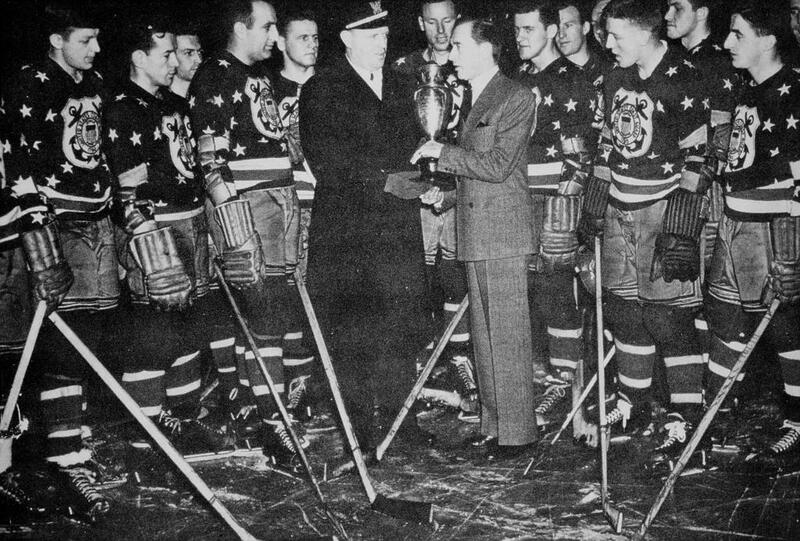 When the Clippers and the Cutters united against common ice foes, they were virtually unbeatable, winning the National Senior Open Championship of the Amateur Hockey Association in 1943 and 1944. 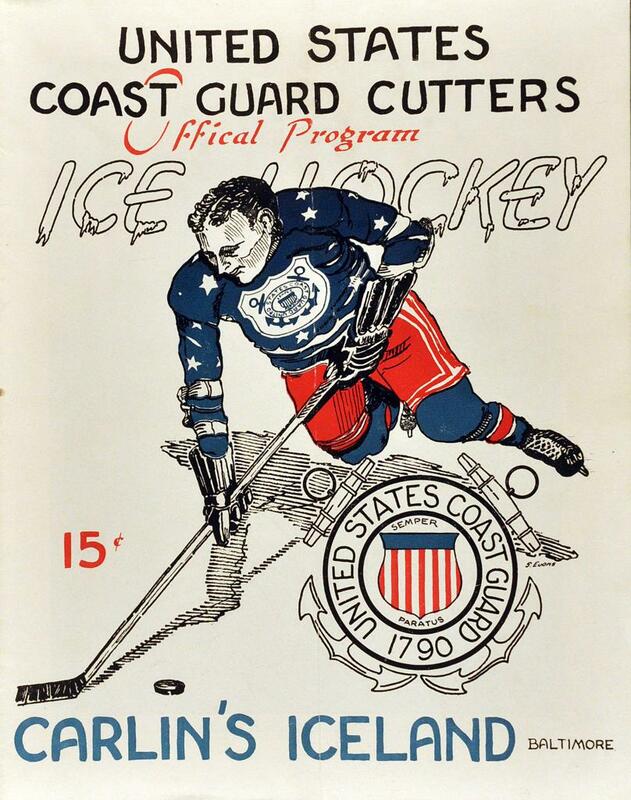 Former NHL referee Mel Harwood coached the Coast Guard skaters on both occasions. The Cutters would play exhibition games against strong Canadian service teams liberally sprinkled with pros and invariably beat them. 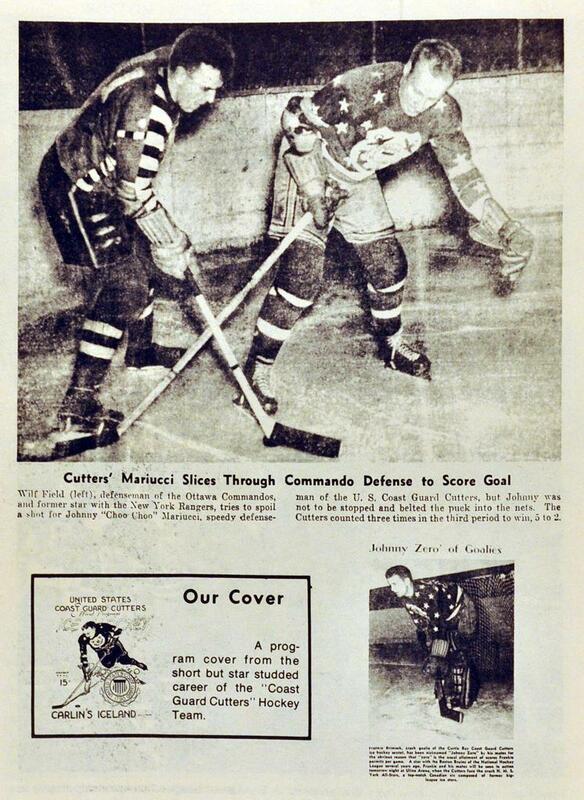 Against the powerful Ottawa Commandos, who were led by ex-Rangers' stars Neil Colvile and Alex Shibicky, and Joe Coper of the Black Hawks, the Cutters triumphed, 5-2. 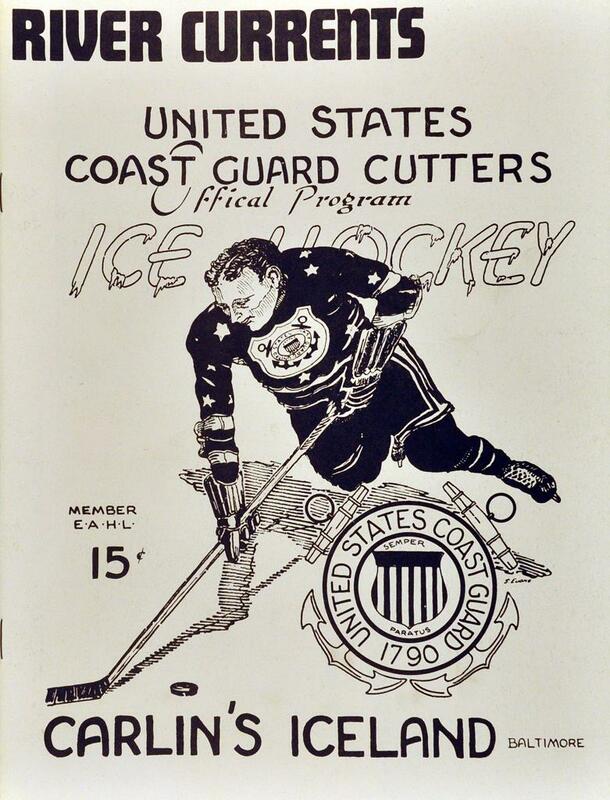 One of the Cutters' toughest games' was against the 1943 Stanley Cup champion Red Wings on January 6, 1944 before a capacity crowd in Baltimore. With Brimsek in goal, the Cutters hung tough until well into the third period - they trailed 4-3 - but were ultimately shellacked, 8-3. "They didn't intimidate us," assures Cotlow, "but they were a little smarter." 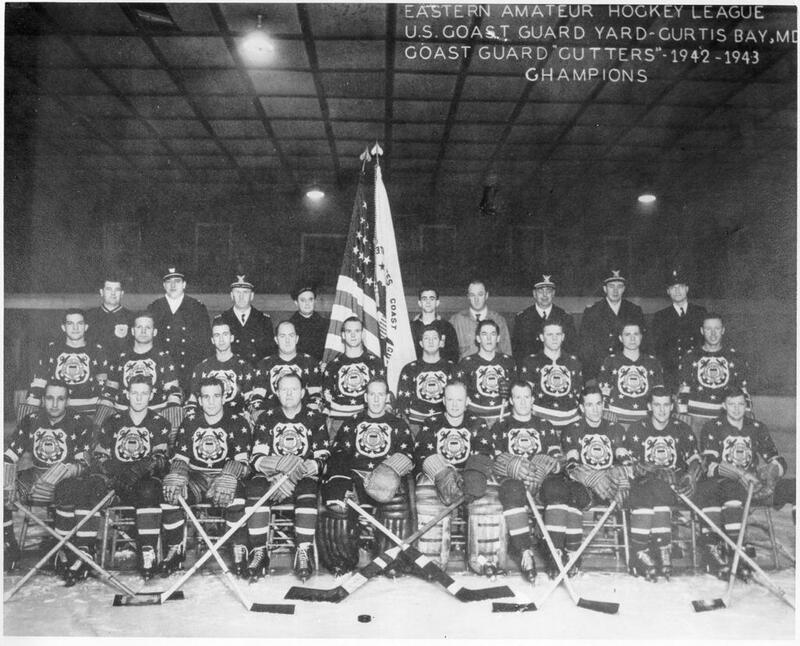 Despite the Cutters' popularity in Boston and New York, were they regularly drew crowds of more than 12,000, they were criticized in some quarters and finally were disbanded in 1944. 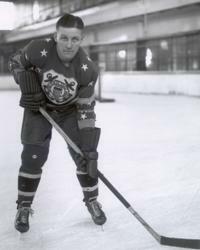 "A lot of parents of servicemen couldn't understand why heir sons were overseas fighting while we were still playing hockey," said Kucler. "The Coast Guard was under a lot of pressure to break us up." The end was in sight one afternoon when an announcement blared over the Madison Square public address system while the Cutters were playing the New York Rovers. Kucler, the club's leading scorer, was ordered to report for action after the match. 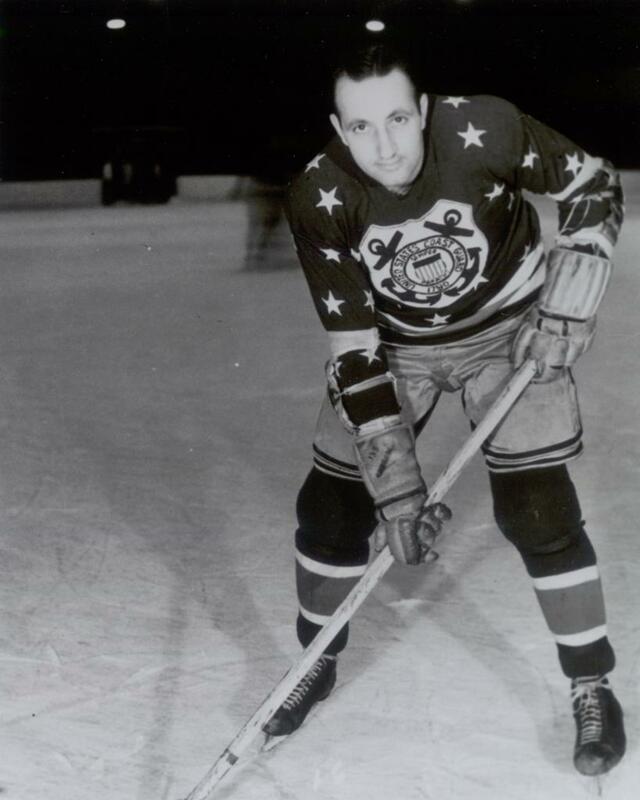 Olsen, a former official for the NHL, remembers the Cutters' end: "They said that Joe was playing his last game for us and then would be shipped out. As soon as Joe left, they began getting rid of the other guys and, by then, we know the honeymoon was over." After the war, Coutler retired but Mariucci and Brimsek returned to play several years in the NHL. 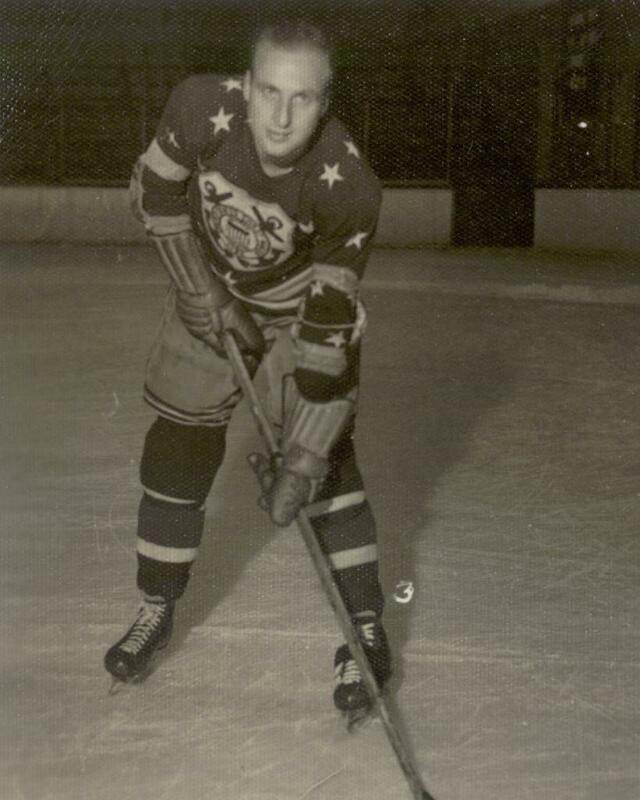 Others, such as Nardello, played minor league hockey. "I kept wearing my jersey," said Nardello, "because it always gave me the feeling that those great guys - Cotlow, Kucler and the rest - were somehow around for another chorus of Semper Paratus."